Pushes of Trump’s administration to return to fossil fuels do not concern clean energy sector, specifically Tesla and Nikola Motor Co, both named by one of the most significant scientists ever- brilliant Serb Nikola Tesla. And whereas Tesla manufactures cars, Nikola Motor Co will manufacture semi-trucks and their first one, called Nikola One premiered on Thursday at invite only event in Salt Lake City, where the company’s headquarters are located. The company plans to build a manufacturing plant supporting thousands of new jobs and is currently in the talks with state governments regarding its location, which should be revealed in 2017. 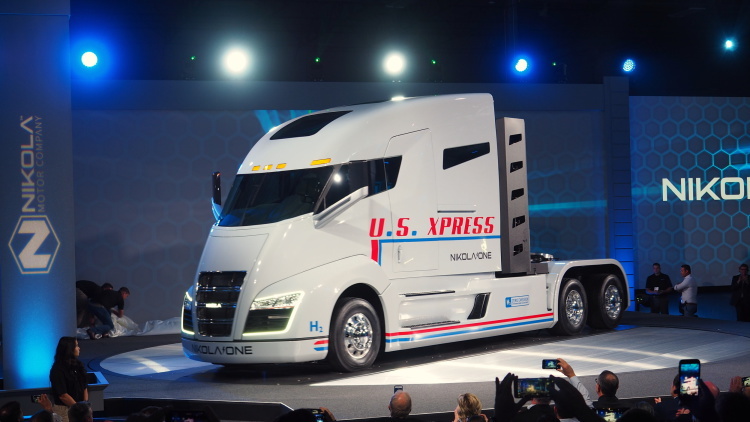 Nikola One is emissions-free vehicle, technically a heavy-duty truck in the Class 8 weight segment and it will be powered by high-density lithium batteries as well as an 800v hydrogen fuel cell, the privately-held company said. The powertrain will produce 1,000 horsepower and generate 2,000 pound-feet of torque. It will travel 800 to 1,200 miles while carrying a full load of 65,000 pounds without stopping at a hydrogen fueling station, Nikola said. For more details, visit Nikola Motor’s website.